= Nee, Mama ga inai aida ni tabechaou ka. = Hey, why don’t we eat that while Mom is away. = Hum? My meal is gone. = Eh!? Boku wa Mama ga inai aida, zutto nete itakara shiranai yo. = What? I don’t know anything ‘cause I was sleeping the whole time you were gone. 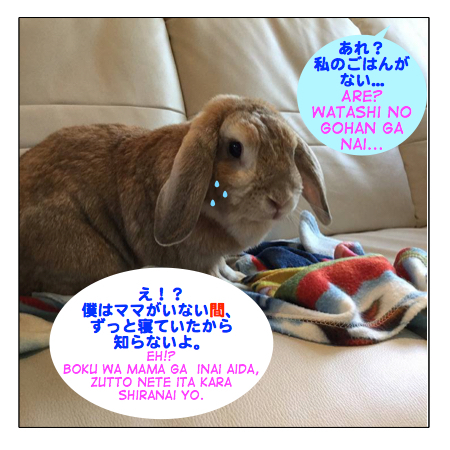 Papi-Sensei is back with his bunny friend, うさ太朗（ = Usatarou) to make a request lesson. = Papi and Usatarou are here. 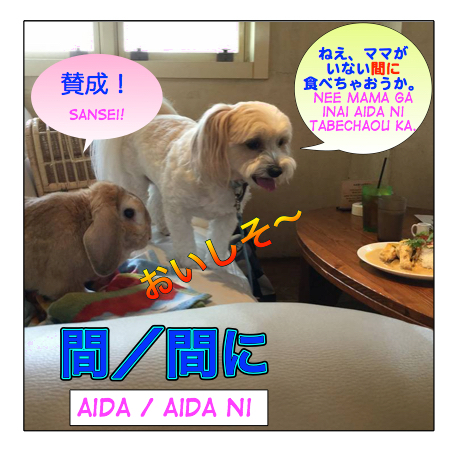 We are going to teach you the difference between 間 ( = aida) and 間に ( aida ni) today. = Nagoya is between Tokyo and Osaka. = Kuji kara rokuji no aida, shigoto desu. = I work from nine to six. You use both 間 ( = aida ) and 間に ( = aida ni ) but they are slightly different. Let’s look at each one individually. →on-going actions during a certain period of time. = Natsu no aida, juku de benkyou wo shiteita. = I had been studying at a cram school during the summer. = Kodomo ga, shokuji no aida, zutto terebi wo mite ita node chuui shita. = I scolded my child because they were watching TV the whole time during their meal. = Haha ga dekakete iru aida, hirune wo shiteita. = I was taking a nap while my mother was away. = Watashi ga ryokou de rusu no aida, hana ni mizu wo agete kudasai. = Please water the flowers while I am gone on my trip. = Kare wa watashi ga shabette iru aida zutto damatte kiite ita. = He kept quiet and just listened to me while I was talking. = Watashi ga kaimono wo shite iru aida, soko de hon wo yonde matte ite kureru? = Can you read a book and wait for me there while I shop? = Deeto no aida, keitai no dengen wo kitte oita. = During my date, I turned off my cellphone. When you emphasize what came before, you use 間は ( = aida wa). = Haha ga dekakete iru aida wa, otouto no mendou wo minakute wa ikenai. = When my mother is away, I have to look after my little brother. = Kodomo ga chiisai aida wa, hataraki ni iku no ga muzukashii. = When my child is little it is hard to go to work. = Boku ga inai aida wa, heya wo suki ni tsukatte iiyo. = Feel free to use my room while I’m gone. = Akachan ga nete iru aida wa, shizuka ni shite. = Try to keep quiet while the baby is sleeping. (1) While / During (A), you want to do something/ You have to do something. →You choose that time period to do something. / You do something intentionally during the time period. = Haga ga inai aida, geemu de ason de ita. = While my mother was away, I had been playing the game. →The whole time when my mother was away, I was playing the game. = Haha ga inai aida ni geemu de ason da. = While my mom was away, I played the game. →I would get in trouble if my mother found out I was playing the game too much so I took out the game as soon as my mom went out and played the game until she came back. So you use 間に ( = aida ni) when you take advantage of the time to do something. = Yasumi no aida ni kanji wo nihyakko oboeta. = I learned 200 kanji during the holidays. = Oyaga dekakete iru aida ni heya no katazuke wo shinai to ikenai. = I have to clean up my room when my parents are away. = Maggie sensei ga nete iru aida ni oyatsu wo totta hito wa dare desu ka? = Who took Maggie Sensei’s snack while she was sleeping? = Kare wo matte iru aida ni juusu wo kaini itta. = While I was waiting for him I went to buy juice. = Chichi ga mada genki na aida ni fujisan wo misete agetai. = I’d love to show my dad Mt.Fuji while he is still healthy and energetic. = Wakai aida ni iroirona kuni ni ryokou wo shite oita hou ga ii. = You should travel as much as possible while you are young. (2) While / During (A), someone do/did something/ something happened. So in this usage, you don’t control your action. You just state what happened during the time period. = Rusu wo shite iru aida ni takkyuubin ga kita. = While I was away, the delivery service came. = Rusu wo shite iru aida, takkyuubin ga kita. Because as we explained above, 宅急便が来た ( = takkyuubin ga kita) is just one time action. = Kare wa shiranai aida ni dekakete shimatta. = I was gone before he realized it. = Kissaten de ocha wo nonde iru aida ni ame ga yande ita. = It stopped raining while I was having a cup of tea at the coffee shop. = Koko nikagetsu no aida ni zuibun nihongo ga joutatsu shite kita. = My Japanese has improved in the past two months. = Papi Sensei, Usatarou Sensei, arigatou! = Thank you, Papi-Sensei and Usataro-Sensei! = Minna ga benkyou shiteiru aida ni watashi wa ohirune shimasu. = I am going to take a nap while you are studying. Hi Maggie-Sensei! Thanks for the great lesson! Could you help me with this sentence? Ex. 喫茶店でお茶を飲んでいる間に雨がやんでいた。 = It stopped raining while I was having a cup of tea at the coffee shop. ウトウトしている間に、テレビの番組は終わっていた。’While I was dozing, the TV program ended’. Maybe this lesson might help you understand. If you are describing what happened in particular moment you use simple past form. 1) Can I say 雨がやんでいる to mean “The rain has stopped” = “There is a state of no-rain right now” ? If this is true, is it correct to say that 雨がやんでいた has exacltly the same function as 雨がやんでいる, except that the time of reference is in the past? 2) Based on my understanding of the grammar, the sentence 喫茶店でお茶を飲んでいる間に雨がやんでいた means “While I was having a cup of tea at the coffee shop, the rain was already over”. In other words, while I was having a cup of tea, there was already a state of no-rain. In other words, the rain had stopped before I entered the shop, or, at the very least, before I started drinking the tea. Contrary to my understanding of grammar, it seems to me that 喫茶店でお茶を飲んでいる間に雨がやんでいた actually describes a passage from a state of rain to a state of no-rain (During that interval of time while I was drinking the tea, the rain stopped. In other words, “It stopped raining while I was having a cup of tea at the coffee shop.”, as you translated ). Also, I have no problems with 8時にはもう家に帰っていた/ いました。(from the lesson you linked). This sentence makes perfect sense to me. You say 雨がやんでいる describe the current state when you just realized it has stopped raining. やんでいた You don’t know when it stopped raining but in some point in past it stopped raining. = The rain stopped while you were doing something. Not before you entered the coffee shop. I might be easier if I can draw a picture but I can’t post it here. You know what, let me make a little note with picture for you on Patreon page. Is that OK? Thank you for you efforts and lessons. The explanation of Aida and Aida ni is amazing. But I have a small doubt related to conjugation. Can we use i-adjective and na-adjective before Aida and Aida ni? = Kodomo ga chiisai aida wa, shigoto ni iku koto ga dekinai. = Soto ga akarui aida ni kaeritai. You said “If not clear, you use うちは”. あと、”子供が小さい間は*、仕事に行くことができない” => can this also be translated as ” Children cannot go to work when they are (still)young”? Please eat/help yourself while it’s hot. You also use うちに when you expect some kind of change. There’s also a second question you didn’t probably notice. Sorry, 天人. I must have missed the question. Hahaha 😂 possible but grammatically it should be 子供は小さい間は、仕事に行くことができない。 but everybody can assume the speaker is not children. 私たちが着くと講演はもう始まっていた -> In this sentence, ていた expressess a state that began before the と clause. 彼女が入ってきた時、私たちは食事を終えていました。->Here as well, ていた/ていました expressess a state that began before the 時 clause. 喫茶店でお茶を飲んでいる間に雨がやんでいた -> In this sentence, ていた expresses a state that began during the 間に clause. As for the picture, I’m not sure it’s still useful in the light of what I just said, but if it is, please post it! Oh great! I think you got the idea!! I wonder if this works…let me try.. This one is hard to describe with emoji. 🏫 = get to the place where they have a lecture. Good old timelines always help… Thank you so much! I am thinking of 2 sentences with aida/aidani, but could you help me to check my sentences? The whole time you are sleeping, I’m watching your angel face. The usage of 間に is good! Thank you sensei so much much much. I have a question related to 間にand うちに. They sound the same. Are they interchangeable? Ah, something has come into my mind. We also have 最中に with respect to “During” meaning. You are right. うちに and 間に are very similar and a lot of time they are interchangeable. But for example, when you are talking about the temperature of food/climate which changes by time, うちに is more natural. Please eat this while it’s hot. Please visit Japan while it’s cool. 最中 means right in middle of doing something. As always, thanks so much much much. Sorry if you explained it already, but I still just don’t get why for this sentence it had to be 間に and not 間.
I know you said its because the 宅急便が来た is just a one time action, a one time thing. But then I get confused when in these example sentences, it is alright to use 間. These are also just one time actions, right? Right. 宅急便が来た is one time action which just takes a couple of minutes. 昼寝をしていた・黙って聞いていた・待っている are not one time action. It is on going action/ has/had been sleeping/listening/waiting. Oh now I know what you are talking about! Sorry, I don’t know why I couldn’t get it. Thank you! I have also come across one example sentence I think has a typo. = I went to go buy some juice while he was waiting. I think the English translation should be “While I was waiting for him I went to buy juice”? Thank you for spotting the translation mistake. I will fix it right away. The other day, I saw a black cat , or That time, I saw a black cat. Kono aida, kuro neko wo mita. Am I wrong? I think I’ve heard used this way. Ex. Thank you for the other day. = この間はありがとう。= Kono aida wa arigatou! Ex. I went to the zoo the other day. = この間、動物園に行った。= Kono aida doubutsuen ni itta. Though 間に(あいだに） is more general, you use 間（ま）に in set phrases. (Sorry. I am a little confused. Ah OK, I explained the difference in my ありがとう lesson.Click here.